Incepted in the year 1958, at Karnal (Haryana, India), we “Piara Singh & Sons” are an ISO 9001:2008 Certified entity engaged in manufacturing and supplying a qualitative assortment of Agricultural Machines, Concrete Mixture Machine and Trailer And Trolleys. Our company is Sole Proprietorship (Individual) based company. 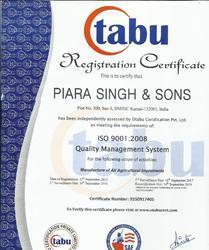 Under the supervision of “Mandeep Singh”, we have achieved strong position in the market. We offered our products under the brand name "FIELD MASTER". We have an ultra-modern infrastructural unit that is spread in the area of 4800 Gaaj. 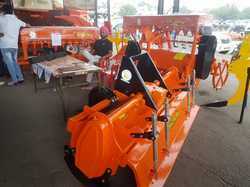 It is divided into different parts like procurement, quality controlling, manufacturing, R&D and warehousing & packaging. To meet the urgent requirements of our clients, we have installed modern tools and machinery in our infrastructural unit.